+++++‘Of course I like the movies,’ Miss Roscow almost indignantly said, thinking doubtlessly that she might be mistaken for a blue-stocking reformer. ‘I get a great deal of pleasure out of music and books and like all normal humans certainly like the movies. But athletics are my hobby.’ ‘Tell me about the medals you won in tennis,’ a friend called, but being naturally shy, Miss Roscow refused to say anything about the medals she won. However, she said, ‘I just love tennis and never miss a game if I can help it.’ Miss Roscow is one of the most enthusiastic fans in Butte and is an excellent player. +++++When the interviewer commented on the quietness of her clothes, she said: ‘I don’t want to call attention to myself in a courtroom and for that reason I almost always wear blue suits and small hats. I also keep my hat and coat on during court. I surely would look foolish if I attempted to come into the courtroom in a georgette waist and picture hat. No I don’t despise those things in their place, but rather like them the same as other women. But I don’t wear flat-heeled shoes or tortoise shell glasses,’ she concluded with a laugh. 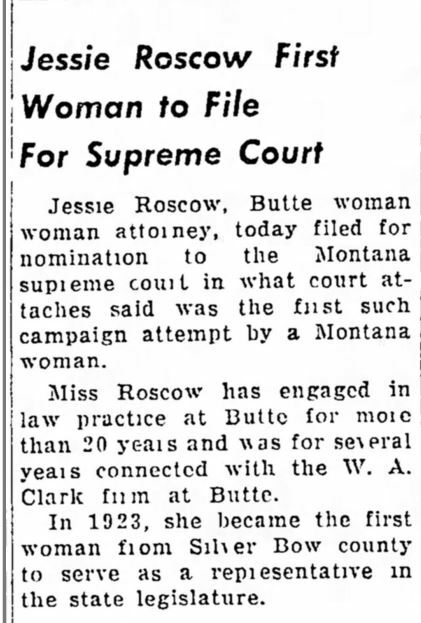 +++++“Silver Bow county’s first woman legislator, Miss Jessie Roscow, of Butte, is one of Montana’s few woman lawyers, and one of the first to practice her profession in Butte. She came to Montana from Lincoln, Neb., where she received her education. She denies emphatically that she started out with the idea of becoming a lawyer. Her hobby during her school days was drawing, and she hoped to become an illustrator. But too close application to the drawing board resulted in eyestrain, and she was forced to give up that ambition, so turned her energies to the business world. +++++After some experience in the law offices of Lamb & Walker, and Jesse B. Roote, Miss Roscow decided that a knowledge of law would make her more valuable in her chosen line of work, so she studied law at the Silver Bow law school, and was admitted to the bar in June, 1917. The following May she began the practice of law in association with her brother, Lyman J. Roscow, under the name of Roscow & Roscow. She later became connected with the legal department of the W. A. Clark interests, and in addition to that association continues to handle a steadily increasing private practice. +++++Miss Roscow states she has a decided preference for probate practice, and she has had marked success in this line of work. Calling as it does for close attention to minute details, she feels that women are well adapted to its demands. +++++However, Miss Roscow does not devote all her time to work and study. She takes a keen interest in outdoor sports, and as she herself says, ‘sometimes plays a good game of tennis,’ but claims that it is more by luck than by good playing that she has won her trophies at that game. She takes a thoughtful interest in public affairs, but has never taken an active part in club work, except in the work of the recently organized Rotana club, in Butte, of which she is secretary and legal adviser. +++++Announced her intention to file for associate justice of the State Supreme Court on a non-partisan ticket in May 1944. +++++“JESSIE ROSCOW has stood in the front rank of women lawyers at Butte for more than a decade of years, and nothing has been allowed to divert from her profession. She has never relied upon others to do her work, and every question is investigated until the subject is exhausted. While not controlled by precedents, she personally examines every case where the subject has been involved, in other to extract the principles applicable to the matter at hand. +++++Miss Roscow was born at Red Bud, Randolph County, Illinois, and is a daughter of William R. and Edith (Tolin) Roscow. Her parents, who were natives of Illinois, came to Montana in 1906, and her father, who was for many years engaged in business in Illinois, Nebraska and Montana, is now living in retirement. There were three sons and two daughters in the family. +++++Jessie Roscow graduated from the high school at Lincoln, Nebraska, following which she applied herself to the study of law under private instruction. She was admitted to the bar in 1917 and in 1918 commenced practice at Butte, where she has since built up a large and profitable clientage of the best kind, her offices being located at 404 Lewisohn Building. In her practice one of Miss Roscow’s most remarkable qualities is her ability to make a correct and logical statement to the court. This is done in language which cannot be misunderstood, and when presented orally it is with a clear voice and appropriate emphasis, giving the greatest pleasure to the listener. The manner is one of honesty and candor which leaves no room for doubt as to her own convictions. She has always endeavored to aid the court in arriving at correct conclusions, both as to fact and law, believing it the highest duty of a lawyer to see that justice is done. In fact she commands the highest respect of judges and lawyers, and as a citizen is beyond reproach. She has always been prominent in public affairs, and in 1922 was elected a member of the State Legislature, in which body she served with commendable zeal and ability. Jessie Roscow is my Great Aunt. What a WOMAN. I am sorry that I didn’t take advantage of Her, well of wisdom. (Young and Dumn!) I’m 75 now, and I want my Aunt Jessie to know, I love Her.